Developing Core Communication and 21st Century Life Skills of Global English language learners so they can communicate with confidence and contribute to their communities. We take PRIDE in our five shared values. They form a key component of our strategic planning process which drives the Centre’s business direction. They are reflected in our objectives, policies, procedures and processes and help us to synergise in our daily work activities. Here we define what they are and what value they have for us in our day to day work. Professionalism is the execution of competency and reliability. We value professionalism because we believe in doing the right thing for our learners. Professionalism and Respect are the founding values upon which our Centre’s educational philosophy is based. Our Spirit comes from our integrity and dynamism. Integrity is doing what we say and being held accountable for our words and actions. We value integrity to ensure the name of the Centre always inspires trust. Dynamism is demonstrating a can-do attitude in our daily work activities. We value dynamism as it is the positive energy that propels us towards realizing our mission and vision. 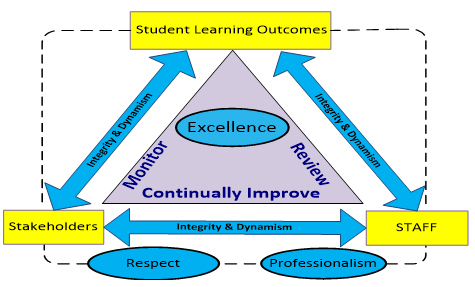 At the apex of these four values is our core value of Excellence. Excellence is the habitual pursuit of continual improvement. As educators, we value excellence as we are committed to learning and to continually improving our courses and services to serve our customers better.